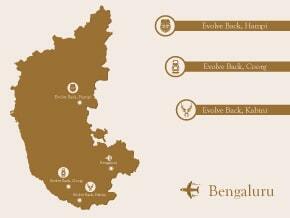 Just 81 km away from the newly opened Kannur International Airport, Evolve Back, Coorg has now moved closer to you. To celebrate this milestone, we are delighted to introduce a specially crafted Flight & Transfer Offer. 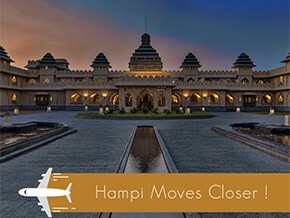 Evolve Back, Hampi is now just a short flight away! Trujet commences daily direct flights to Hampi (Vidyanagar Airport) from Hyderabad and Bangalore. 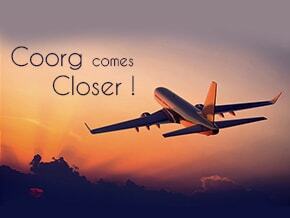 The airport at Hampi (Vidyanagar Airport) is located just 29 km away from Evolve Back, Hampi. 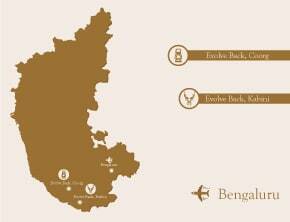 To celebrate this milestone, we are delighted to introduce a specially crafted Flight & Transfer Offer. Experience the many worlds of Evolve Back. A sublime journey that takes you through a landscape littered with history, heritage, old-world graciousness and rustic charm combined with one of the finest wildlife experiences in India. Embark on a voyage to the heart of Evolve Back. Experience the laid-back life of a Gentleman Planter in a 300-acre working plantation in Coorg and then move on to discover your wild side in Kabini - one of the finest wildlife destinations in India.